Haiyoru! Nyraru-ani is the heartwarming story of the loli personification of Nyarlathotep (Nyarlko) who is a by-the-books otaku wish fulfillment nerdy chick, who is in love with a normal guy called Mahiro who can only keep this non-tentacled horror under control with a hastily brought down fork slammed right throough her hand. Also; later in the series, we meet Cthuhko, who is the Japanese loli imagining of Cthulhu. And rather than looking like an octupus god like figure from the sunken sity of Rl'yeh, she is actually a kuudere girl who wants to feast upon Nyarlko's carpet. So, that is basically the story and the character section rolled into one. I won't tell you what I think of what I just wrote, because due to whether or not you are a Cthulhu mythos fan or not this could sound like the worst/best thing ever written by mankind. The next thing to talk about is the art, which is as far as anime art goes is quite bland and ugly, and the animation is rather low quality. However, I can be a bit more forgiving here due to the fact this was made with Flash, a program in which I can barely get a stick figure to move it's legs. The sound was decent. The few VAs there were had done somewhat well known characters (Yuno from Hidamari Sketch, Harumi from SZS) and the ending theme after each and every segment was nice, whilst somewhat annoying if you are watching the whole thing from back to front. I enjoyed myself quite a bit, in no short thanks due to the constant stream of Lovecraftian/Anime and Manga references they popped in at opportune spots. And whilst I realize this was nothing but an advertisement for a novel I will never see translated in my life time (and screw learning Japanese, Spanish is hard enough) I can say that it certainly amused me for its short run time. All in all, I recommend this series if you are a Lovecraft fan. Partly because you may find the show's humour enjoyable, and partly because I might derive morbid entertainment from your screams of terror as you list down everything that this anime just raped about your beloved Mythos. Non-Lovecraft readers might enjoy it as well, just don't expect to know what the hell is going on half the time. I rate it 7 grave rolls out of 10. Haiyoru!Nyaruani is an anime with a purpose: To sell the plot of a series of light novels like hotcakes. However, it lacks the bells and whistles to move past this purpose, and ends up drifting into the realm of forgettable. As stated before, this series was made with the intention of promoting the light novel series that it's based off of. As you can imagine, this doesn't leave it very much room to develop, especially with the straining 4 minute length per episode. However, there's enough spontaneity and wackiness to make it a worthwhile, humorous, if unmemorable series to watch. The animation obviously won't be winning any accolades, due to being entirely done in Flash. While it isn't bad, it's very minimalistic, and doesn't allow for much action to take place. The music and voice work are both satisfactory, if not excellent. From the ominous orchestra in the introduction reminiscent of Dr. Horrible to the emotion-deprived wisp of Cthuko's voice to the upbeat ending, the auditory aspect is easily the high point of the series. In short, worth checking out, but don't get your hopes up. It may not be amazing, but it did its job well in promoting the story of these books, and I hope that they may get a translation at a later date. It's split pretty evenly down the line whether fans of the Cthulhu Mythos will find anything to love here, and I'll say that it's an interesting enough take on it to warrant a glance. Haiyoru! Nyaruani is a series of flash shorts based off of the light novel Haiyore! Nyaruko-san. I wouldn't go into this short series expected too much, but for what it is, it's not that bad. As stated before, Haiyoru! Nyaruni consists of nine animated flash shorts that range from around one to two minutes. Being animated with flash, you can't really expect the animation to be that good, but I did like the cute, chibi-like designs that the characters had. Other than that, the art is pretty bland with blank, empty backgrounds that occasionally included a couch or some other prop. For sound, the voices were done pretty well in my opinion and suited the characters nicely. The music was ok. The ed was fine, but over time it sort of began to feel repetitive and annoying. 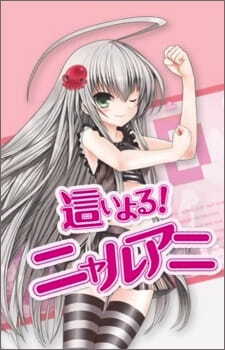 The characters mainly consist of Mahiro, who is just an average, normal guy and Nyaruko, the crazy Nyarlotephian who is madly in love with Mahiro. Later on, Cthuko does show up, and Shanta appears in an episode as well. For what it is, I actually enjoyed Haiyoru! Nyaruani. Of course, to actually enjoy the series, you'd need to have either read the light novel or watched the anime for the characters and jokes all derive from that. You'll most likely enjoy these shorts if you are a Cthulu Mythos fan as well, but I'm a bit unsure about that one since I don't really know much about the series, though I do know most of Haiyoru! Nyaruani's references are about it. Being a fan of the anime, I actually found these shorts to be pretty funny, and they exceeded my expectations humor-wise. All in all, this short series did it's job pretty well, which was to help sell the light novel. If you're a fan of any of the series listed above, I'd give these shorts a watch as they are pretty humorous, and a quick watch for anyone looking for something short to binge-watch.